Singer and actor Lee Seung-gi held a fan meeting entitled "Lee Seung-gi Japan Debut Premier" twice at the Tokyo Dome City Hall in Tokyo on March 21 with the fans who had purchased his Japanese debut single "Alone In Love". Lee Seung-gi said to his fans who attended the event, "I came here right after I finished filming the drama until 5 am in the morning". He also revealed his feelings about his debut single "Alone In Love", which was released in March 6 and ranked atop the Oricon daily chart, saying, "It was all thanks to you. I had concerns about whether this album could achieve success or not in Japan, but you have encouraged me and supported me. It was you who made my album rank atop the chart. Thank you. I will continue to do my best". In addition, Lee Seung-gi explained his appearance in the new MBC drama entitled "The King 2 Hearts", saying, "It is a black comedy drama that emphasizes humanity while treating sensitive issues in pleasant and cheerful ways". He unveiled the video of the film set and actress Ha Ji-won's encouraging message, which created excitement in the hall. Lee said, "I have been exhausted from a tight filming schedule, but I could completely be recharged by looking at you". 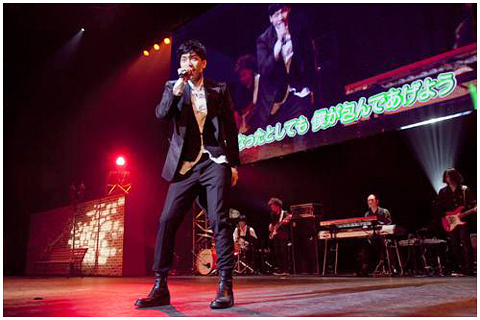 Then he sang some songs: his Japanese debut song "Alone In Love", "We Are Friends", and "Smile Boy" to music played by a band, and the venue was filled with an enthusiastic response. Lee Seung-gi, who will hold his first solo live concert at Budokan on June 1 only three months after his debut, said, "I am very glad that I can perform at such a good concert hall thanks to you. Please come and enjoy the concert together". He also promised his fans that he will concentrate more on holding activities in Japan after he finishes the drama and his first concert in Budokan. Lee Seung-gi's first best-of album entitled "Lee Seung-gi - The Best" will be released in both Japan and Korea on April 18, and the Japanese version of his fifth album "Tonight", which was released in Korea last year in October, will be released in Japan on the same day.